November 11, 2015 – Aerospace’s FEEPS instruments (Fly’s Eye Energetic Particle Spectrometer) recently began transmitting data for scientists to analyze. The eight FEEPS instruments and their mission were originally proposed in 2005 and, after some program delays, were launched from Cape Canaveral, Florida earlier this year as part of NASA’s Magnetospheric Multiscale (MMS) mission. The primary job of FEEPS is to obtain nearly instantaneous all-sky measurements of how many electrons of different energies and different arrival directions are present. The four satellites containing the FEEPS instruments are flying in a tetrahedral formation around an elliptical orbit to investigate a phenomenon called magnetic reconnection in Earth’s magnetosphere. “We’re getting really huge amounts of data,” said lead investigator Dr. J. Bernard Blake, Aerospace distinguished scientist in the Space Science Applications Laboratory. Blake explained that analyzing the data is complicated because FEEPS data must be melded with data from other sensors on the satellites in order to produce measurements that will be scientifically useful. Magnetic reconnection is a little-understood phenomenon in which magnetic fields disconnect and reconnect, rapidly transferring energy between the fields and the ambient charged particles. It is thought to be a universal process, occurring in the atmosphere of the sun and other stars, in the vicinity of black holes and neutron stars, as well as near the Earth. 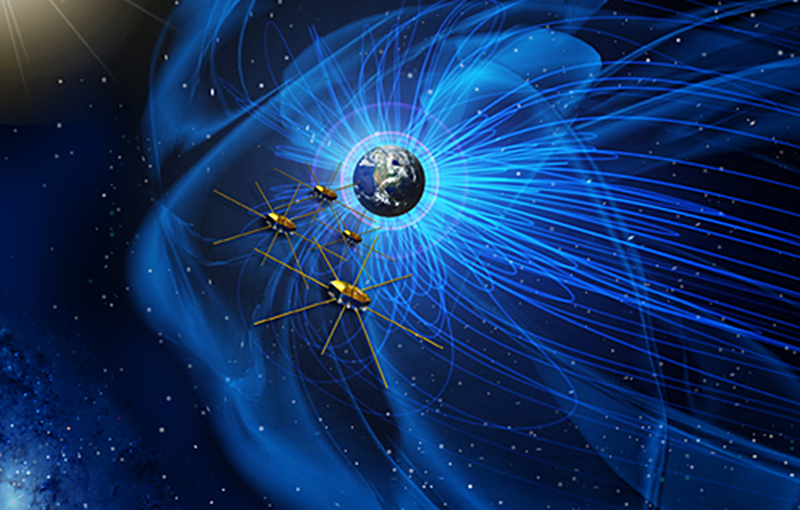 Magnetic reconnection is also an important driver of space weather events that affect space systems, navigation and communication networks, and electrical power grids. On the sun-side of Earth, reconnection can link the sun’s magnetic field lines to Earth’s magnetic field lines, allowing material and energy from the sun to funnel into Earth’s magnetic environment. On the night side of Earth, reconnection is believed to help trigger aurora, also known as the Northern or Southern lights. Reconnection occurs when magnetic field lines cross and release a gigantic burst of energy. Due to the limits of observing instruments, magnetic reconnection can only be studied in our solar system and it is most accessible in near-Earth space, where MMS will study it. Goddard built, integrated, and tested the four spacecraft and is responsible for overall mission management and mission operations. The Southwest Research Institute in San Antonio, Texas, leads the Instrument Suite Science Team, with the University of New Hampshire leading the Fields instrument suite and Goddard leading the plasma instrument suite with the Fast Plasma Investigation. Science operations planning and instrument command sequence development is being performed at the MMS Science Operations Center at the University of Colorado’s Laboratory for Atmospheric and Space Physics in Boulder.